With the new CA Project & Portfolio Management (CA PPM) 15.3, you can tailor projects to any business unit with drag and-drop ease. Whether complex workflow for HR or simple task management for sales, workers now spin up projects in minutes—not days. Add in-app collaboration to eliminate redundant meetings, a familiar Microsoft Excel®-like grid to manage budgets, a new connection for third-party business intelligence (BI) tools to unearth answers, and you have the most modern project portfolio management app on the market today. 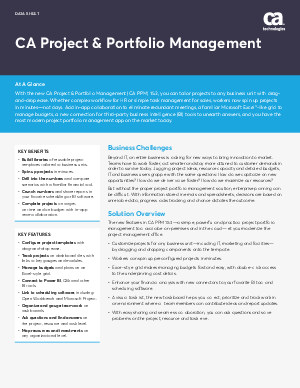 Download this whitepaper today to find out more about CA PPM 15.3—a simple, powerful and practical project portfolio management tool available on-premises and in the cloud—let you modernize the project management office.